1MD, Associate Professor, Department of Medicine, Midnapore Medical College,Vidyasagar Road, Midnapore 721101, West Bengal, India. 2Assistant Professor, Department of Medicine, Medical College, 88 College Street, Kolkata 700 073, West Bengal, India. 3Resident, Department of Medicine, Medical College, 88 College Street, Kolkata 700 073, West Bengal, India. 4Department of Medicine, Medical College, 88 College Street, Kolkata 700 073, West Bengal, India. MD, Associate Professor, Department of Medicine, Midnapore Medical College,Vidyasagar Road, Midnapore 721101, West Bengal, India. Santra G, Paul R, Pradha S, Choundhury PS, Das S. A Case of Giant Left Atrium Mimicking Pleural Effusion. Oman Med J 2014 May; 29(4). Giant left atrium has become rare in present day owing to decreased incidence with earlier diagnosis and treatment of rheumatic mitral valve disease. Transthoracic ultrasonography is remarkable for clear visualization of giant left atrium with clots. 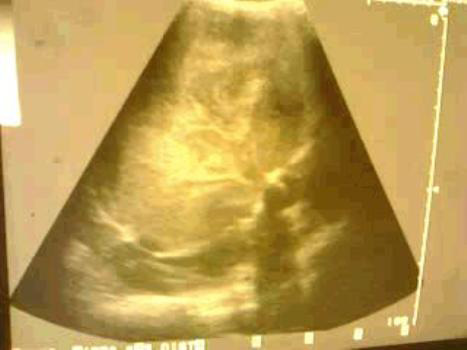 In the absence of clot, ultrasonography picture could be mistaken for aortic aneurysm. In severe left atrial enlargement, chest x-ray may be mistaken for pleural/pulmonary mass or rarely pleural effusion. Ultrasonography and echocardiography may help in diagnosis in such case. A 52 year old female presented with progressive respiratory distress for last two years. She had undergone mitral valve replacement (metallic valve) 24 years back for rheumatic mitral stenosis but for last eight years, the patient did not return for follow-up and had discontinued warfarin. Chest x-ray showed a homogeneous opacity in left hemithorax with obliteration of left costo-phrenic angle suggesting pleural effusion. An ultrasonography of left hemithorax revealed a giant left atrium with spontaneous echogenicity suggesting multiple large non-organized thrombi. There was no pleural/pericardial effusion. Echocardiography also showed a giant left atrium with clots. Keywords: Giant left atrium; Pleural effusion; Ultrasonography, clots. Rheumatic heart disease, especially mitral valve disease is often complicated by alteration in cardiac geometry. Enlarged left atrium (LA) is a common consequence of mitral valve disease.1 This predisposes to atrial fibrillation and clot formation and must be aggressively treated with proper medications to prevent potentially fatal complications like embolism. In post mitral valve replacement, certain changes can occur that may lead to further progression of heart disease. Valve replacement may be complicated with thromboemboli, paravalvular leak (PVL), bleeding due to anticoagulants, structural deterioration mainly of bioprosthetic valves and infective endocarditis. Patients with mechanical prosthesis are at risk of thromboembolic complications and need to be maintained permanently on anticoagulants. Mechanical prosthesis is generally preferred for patients under age 65 who could take anticoagulation reliably. PVL can increase volume load on left atrium with left atrial enlargement that may be a valuable criterion for deciding when to reoperate. Giant left atrium with clots is rare in present days owing to decreased incidence with earlier diagnosis and treatment of rheumatic mitral valve disease, and proper follow-up after valve replacement. Giant left atrium on chest x-ray may misleadingly suggest a pleural pathology. Echocardiography is diagnostic. However, transthoracic ultrasonography (USG) may be enough to diagnose giant left atrium with clot. A 52-year-old female presented with progressive respiratory distress for last two years and significant weight loss (8 kg in last six months). 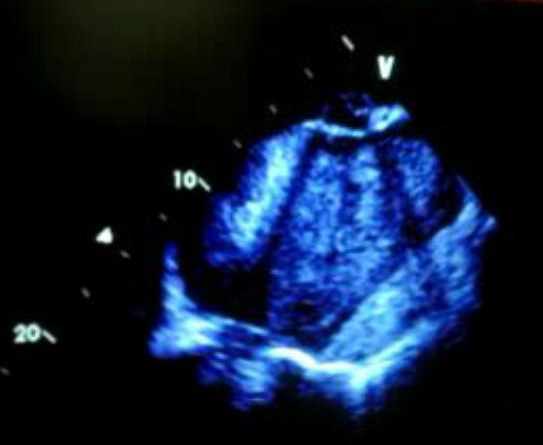 The patient had undergone mitral valve replacement (metallic valve) in 1988 for rheumatic mitral stenosis (left atrial diameter was 55 mm; no spontaneous echo contrast was reported) but for last eight years, she did not return for follow-up and had discontinued all the medicine, including warfarin. The patient did not have any respiratory diseases. On examination, the patient had orthopnea and basal crepitations. She was in atrial fibrillation (rate ~100-130/min) with low blood pressure (100/60 mm of Hg). The cardiac apex was poorly localized, with a prominent left parasternal impulse and variable first heart sound. The P2 component of second heart sound was loud. On examination of the respiratory system, there was rightward shift of trachea with stony dullness over left lower region of chest. Breath sound and vocal resonance were also decreased in the same region. Laboratory investigations showed the following results: hemoglobin 8 gm%; total leukocyte count 9200/cmm with neutrophil 80%, lymphocyte 16%; platelet count of 160000/cmm and ESR of 85 mm/hour. Sugar/ urea/ creatinine values were normal and liver function test showed normal bilirubin (1.1 mg %) with SGOT and SGPT 126 and 88 IU/L respectively. Chest x-ray showed (Fig. 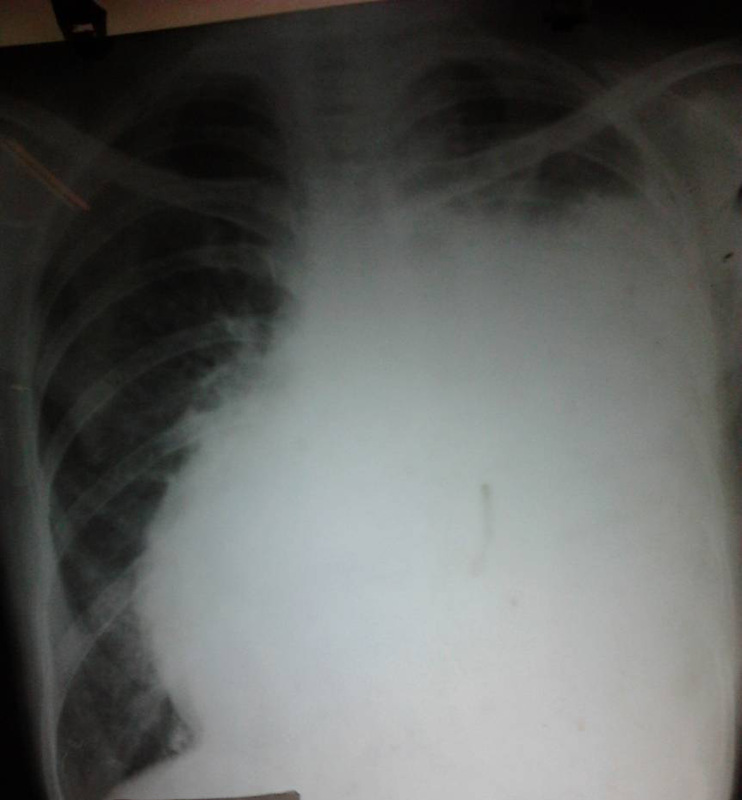 1) a homogeneous opacity in left hemithorax with obliteration of left costo-phrenic angle mimicking pleural effusion. Transthoracic echocardiography showed (Fig. 2 and 3) a giant left atrium (11 cm) with clots in interatrial septum and LA free wall. Prosthetic mitral valve was in place. There was thrombosis along mitral valve cusps and decreased motility of the mitral annulus. Also there was spontaneous echogenicity in rest of the cavity with multiple large non-organized thrombi. The patient was not permitted to undergo trans-esophageal echocardiography (TEE). Also, her condition deteriorated very quickly after admission. The patient also had dyspnea, with frequent episodes of hypotension, reason why TEE could not be done. Figure 1: Chest x-ray mimicking pleural effusion. Figure 2: Transthoracic echocardiography showing a giant left atrium. An ultrasonography of left hemithorax revealed (Fig. 4) a giant left atrium with spontaneous echogenicity. There was no pleural/pericardial effusion. Thus the huge opacity in chest x-ray (Fig. 1) is all due to the enlarged left atrium and the cardiothoracic ratio came 0.76. The patient was put on oral anticoagulants and aspirin. However, after a few days, before any surgical intervention could be done, she had an episode of ischemic cerebrovascular accident and died. 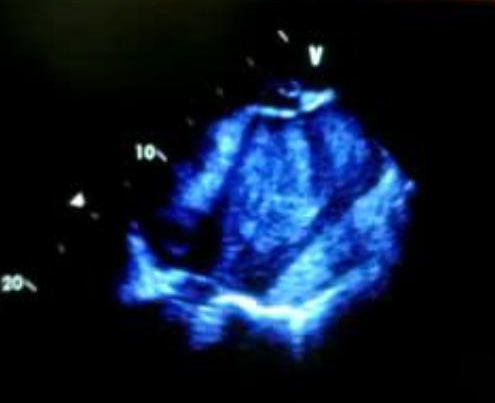 Figure 3: Transthoracic echocardiography showing a giant left atrium. Figure 4: An ultrasonography of left hemithorax showing a giant left atrium with spontaneous echogenicity. In this case, USG and echocardiography revealed a giant LA with spontaneous echo contrast due to multiple large non-organized thrombi, while clinical features and chest x-ray were misleadingly suggestive of a pleural pathology. In such case, high level of suspicion is needed as diagnostic or therapeutic aspiration of pleural effusion after chest x-ray to avoid devastating complication. 1. Kothari AA, Kothari KA. A giant left atrium. J Postgrad Med 2005;51:49-50. 2. Krishnamoorthy KM. 100% Cardiothoracic Ratio. Tex Heart Inst J 2001; 28:334-5. 3. Apostolakis E, Shuhaiber JH. The surgical management of giant left atrium. Eur J Cardiothorac Surg. 2008;33:182–90. 4. Badui E, Delgado C, Enciso R, Graef A, Solorio S, Madrid R, et al. Silent giant left atrium. A case report. Angiology 1995;46:445-8.